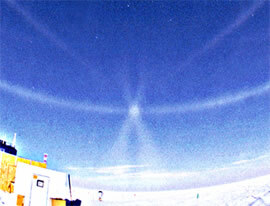 South Pole 11th January 1999. Fisheye view pointing away from the sun by Marko Riikonen . This is usually a halo sparse region but here it is full of arcs, any one of which appearing singly in temperate climes would be a cause for celebration. Mouse over the "Halo key" to identify them. Plate crystals generate two bright 120º parhelia. Singly oriented columns produce the cross centered on the anthelic point. Two arcs, the Diffuse and Tricker, make up the cross. The upper Tricker arc is a loop and the whole arc is shaped like the Ancient Egyptian "ankh" hieroglyph. A subhelic arc touches the top of the Tricker loop ~ a sign that their ray paths are closely related. Wegener arcs converge at the anthelic point. There isn't an anthelion halo as such, it only appears bright because so many arcs overlap there. Parry oriented columns also contribute to the Tricker and subhelic arcs. The antisolar and heliac arcs are sharp and bright in this view and the Hastings arc (see below) is more easily discerned from the prominent Wegener arc. HaloSim simulation and image after levels adjustment followed by unsharp masking. The parhelic circle, Wegener, Tricker and diffuse arcs all cross the anthelic point. The rare heliac, antisolar (subanthelic) and subhelic arcs are stunningly prominent. Specks and streaks are glints from individual low level ice crystals. 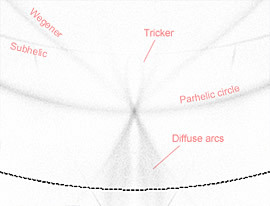 One of the contorted ray paths which form diffuse arcs. A ray enters a side face of a singly oriented column. It internally reflects off three other side faces and then an end face before emerging through the entrance face. Run Halosim to find other paths. Produced by singly oriented columns. Tricker arc rays are like those of the subhelic arc except that the ray path is essentially doubled by reflection from an end face. As seen from the end of the prism the rays, like those of the subhelic arc, are deviated through a constant 120º.